Acton resident Mitchell Jacobs is running a campaign from his home on East Churchfield Road against the 'fourth worst speed hump in Great Britain', according to a survey commissioned by Continental Tyres which was quoted in the Observer newspaper last Sunday. The hump looks, on first inspection, like a perfectly blameless 'sleeping policeman'. However, as I stand admiring the view after ringing Mr Jacobs' front door bell, a skip lorry goes over the hump and as the wheels go over it, there is a noise which sounds like a metallic thunderclap and a vibration underneath my feet. "East Churchfield Road is a cut-through for all sorts of traffic", Mr Jacobs tells me, "There's a small skip yard next to the station (soon to be turned into 12 'car-free' flats) into and out of which 4 skip lorries drive all day long, and another further afield in Horn Lane which has many more lorries - and they often use East Churchfield Road as a cut-through. I've spoken to the manager of our local yard and he told me he was embarrassed by the amount of noise his lorries make, but that there is little he can do to prevent it." However, before the hump arrived last Summer, Mr Jacobs and his family lived happily with a constant hum of traffic outside their house. "Now", he says, "I cannot have a telephone conversation without interruption, we can't sleep at night at the front of the house without wearing ear-plugs, objects fall off surfaces with the vibration from heavy vehicles going over the hump. Our house is suffering cosmetically and, quite possibly, structurally as well. We live with this noise from 6.30am to 8.00pm." Recently, the Council agreed to run a 24-hour survey which, Mr Jacobs told me, "unequivocably supported our complaints and found the noise and vibration levels due to the speed hump were unacceptable." The survey also questioned the installation of road humps when heavy loads are using the thoroughfare. 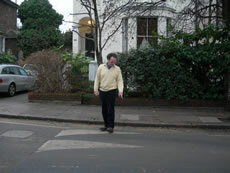 "Of course", says Mr Jacobs, "we supported a traffic calming scheme for East Churchfield Road. Something had to be done about safety for the children coming and going from Maples Nursery school close-by. The original 'consultation' letter informed us humps were to be installed. A plan showed the two outside Goldsmiths buildings and another roughly outside number 20. The two by Goldsmiths buildings were installed last spring or thereabouts. "Then the one outside our house appeared in August - not where it had originally been shown but that's a technical point. I don't think this change would have made any difference to the noise and vibrations. The main point is that there was no mention of potential noise disturbance, vibration and possible house damage. We certainly would have opposed the plan had this been pointed out." Mr Jacobs told me he has the support of 7 out of 10 neighbours in the immediate vicinity. Factors weighing against the hump include the fact that it does not slow down traffic, that it increases pollution for residents, pedestrians - and the schoolchildren (cars slow down then accelerate), and that it has ruined the Jacobs' and other neighbours' quality of life since it arrived in East Churchfield Road. As a result of Mr Jacobs' persistent and consistent campaign, there is to be a meeting on January 29th at 6.30 in Ealing Town Hall, although at this stage he is not clear about whether he or any other members of the public are allowed to attend. The Jacobs are concerned that, since the hump does not slow traffic, the safety issues on East Churchfield Road still need to be dealt with. "With proper consultation and dialogue we could come up with a good solution to this problem. The way the humps were installed showed inadequate planning, consultation and consideration on the part of Ealing Council. "I would like to see proper signing on this stretch of road, a lollipop person for the brief periods of the day children need to cross the road safely, or speed cameras which would provide revenue for the Council from those breaking the law, or chicanes. "My quality of life has been ruined for the past 6 months. If action isn't taken, I will bring a civil action against the Council." Cllr Vlod Barchuk told me "The Council has investigated this, accepted that there is a problem, and are looking to make financial provision to either take out the speed bump or replace it with speed cushions as appropriate; this is subject to agreeing the Council budget for the next financial year." Mr Jacobs is determined. He is ready to do battle with the fourth worst speed hump in Great Britain and anyone at Ealing Council brave enough to defend it.